I know my last update really harshed everyone’s mellow. But now pay heed, friends, for this is a joyous day. 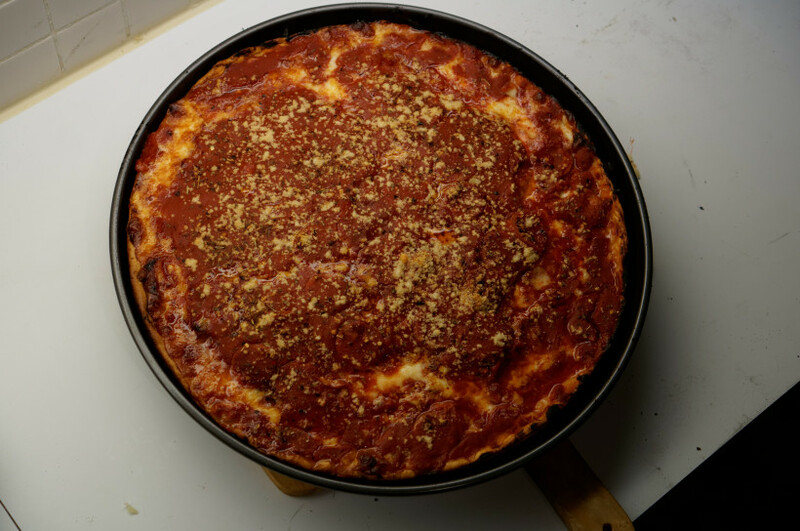 For I have made delicious deep dish pizza and I am going to tell you how I did it! I’ll apologize in advance for over-explaining things. I had to google what ‘proofing yeast’ was before I made this. 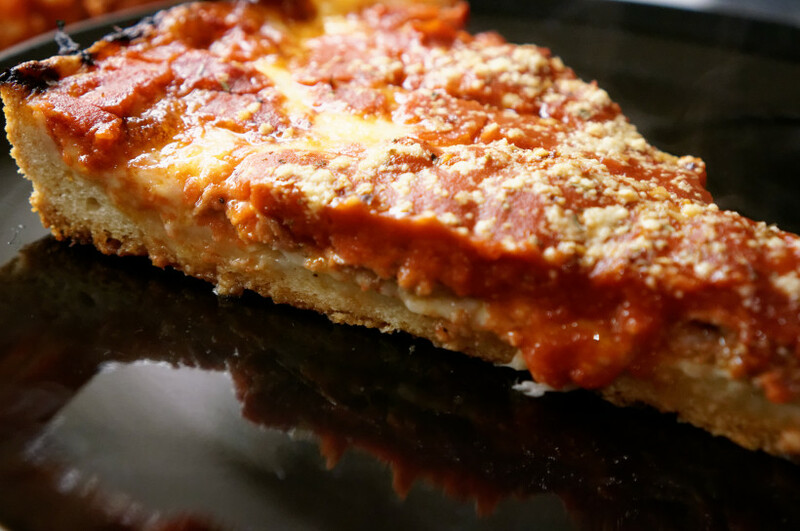 *The flour blend was 80% unbleached all-purpose flour, and 20% semolina. First I put the active dry yeast in a shot glass with 1oz of warm water (100°F). I mixed the flours, salt, and sugar together while waiting for the yeast to foam up. Then I added the ADY mixture and the rest of the water to the dry mix, and mixed it together for a short bit. Then I added the oils, and told my mixer to go to town with a bread hook for just over ten minutes, until there weren’t any weird surface irregularities left. (I overmixed! See note at the end!) 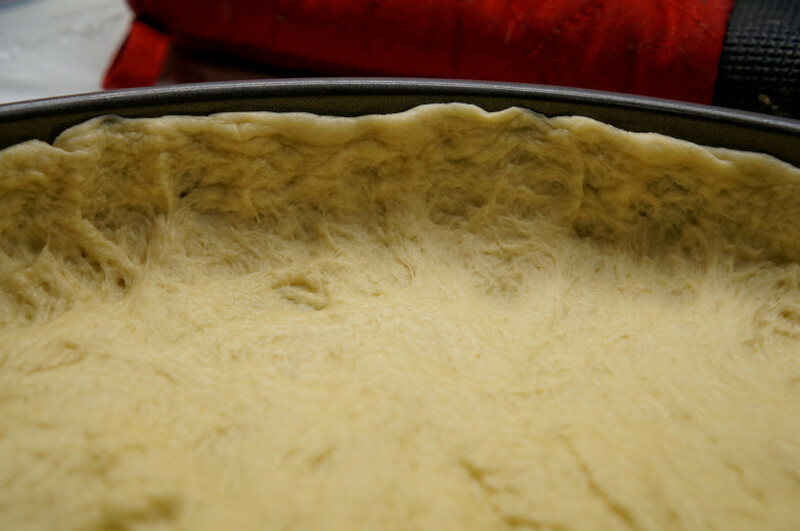 I added the softened butter during the last 30 seconds, so that it doesn’t fully mix unto the dough. Which is what you want. I put the dough ball into an oiled bowl, and left it out on my counter with some plastic wrap on top of it for five hours. I had to knock it down twice during that time. I also had to google what ‘knocking down dough’ meant. 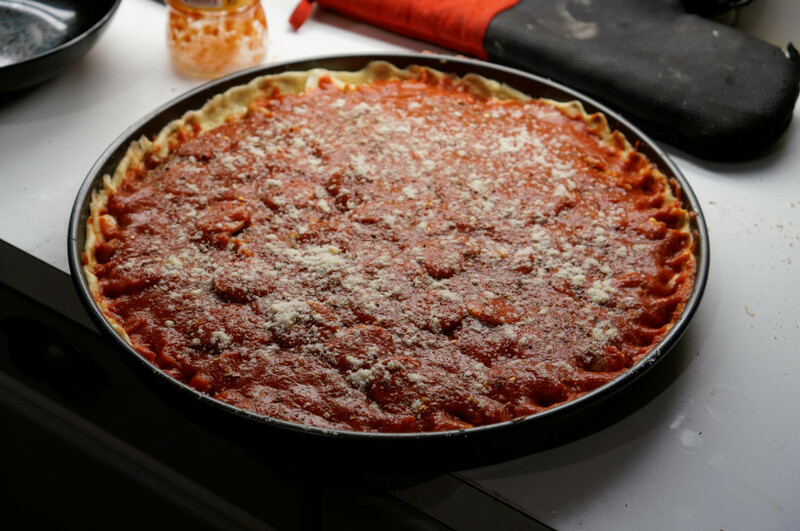 After it was ready to go, I tossed the dough ball in my deep dish pan, after spraying a bit of PAM on the bottom of the pan. Protip! Buy ‘grilling’ PAM and not ‘baking’ PAM. Baking PAM has a weird artificial sugar cake flavour to it. It is weird trust me. 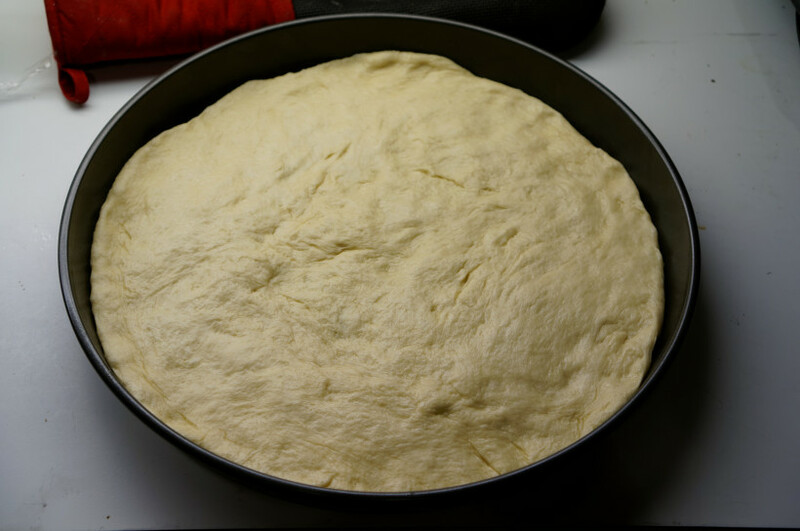 I pressed out the dough from the centre to the sides of the pan, so that there was an even, flat layer of dough on the bottom of the pan. 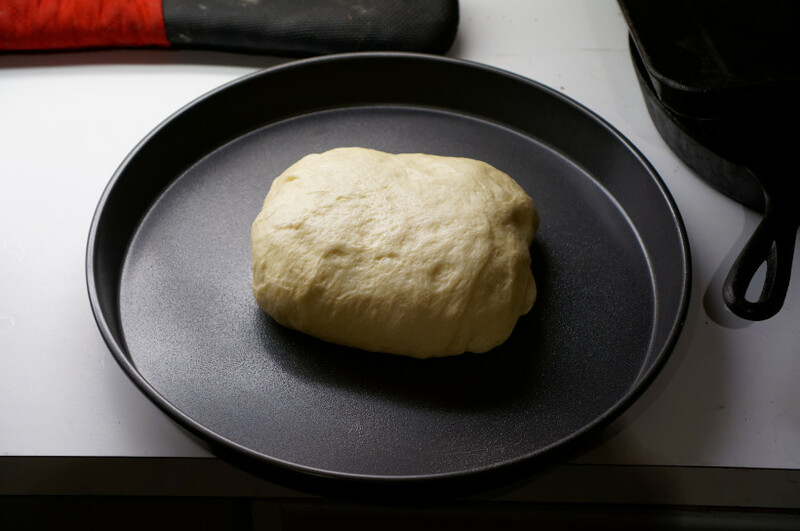 Then I took the edges and pinched the dough as high up the sides of the pan as I could. 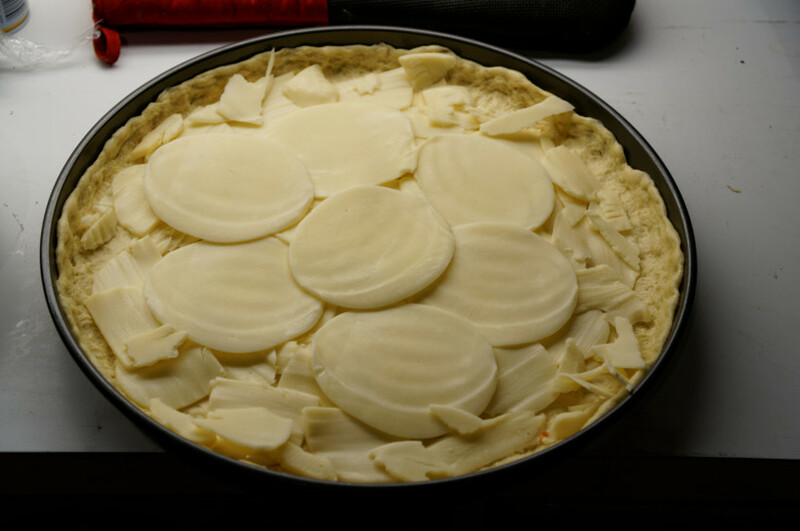 I made the sides as thin as I could without having them collapse. They don’t need to be structural, they’re just keeping the sauce in. It took a few passes to get them to stay. 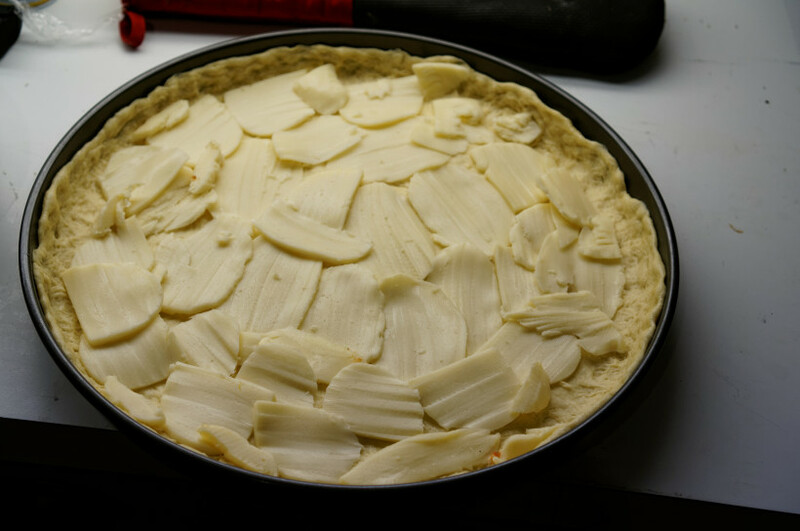 After the dough was all pressed out, I covered the bottom of the pan with sliced whole-milk mozzarella. I used just under a pound and it was a good amount. I also added a handful of provolone slices on top of the mozza to top it off. I sliced open three italian sweet sausages I got from the deli, and spread the meat around the pan. Next time I’ll use a bit more. I also sliced up some pepperoni and added it to half of the pizza because of YOLO. I added the sauce, which was a tall glass bottle of pureed tomatoes. Ingredients: Tomatoes. I added some seasoning to the top (peppers, garlic, basil, oregano, salt, pepper, etc), and then a handful of parmesan cheese. I preheated the oven an hour earlier to 480 with my pizza stone inside. I tossed the pizza in, and lowered the temp to 450. After 35 mins I checked on it, and it looked like it needed a little more time, so I rotated the pizza and gave it another 8 minutes or so. After that, I took the pizza out of the oven and let it stand for 5 minutes. Then I somehow extracted the pizza without destroying it, chopped it up, and everyone’s life instantly became at least 12% better. Post-pizza critique: Holy hannah this was good! Especially for my first time making dough. There’s room for improvement on the dough, it didn’t stretch super-evenly. But I imagine that will come with time. There was also a lot of grease when it came out of the oven, but after a bit of dabbing with paper towels it was fine. Next time I might use leaner sausages, or cheese with lower milk fat content. Beyond that, I don’t know if I’d change much. I’ll try a different tomato sauce to get something a bit less sweet, but that’s a minor personal preference. 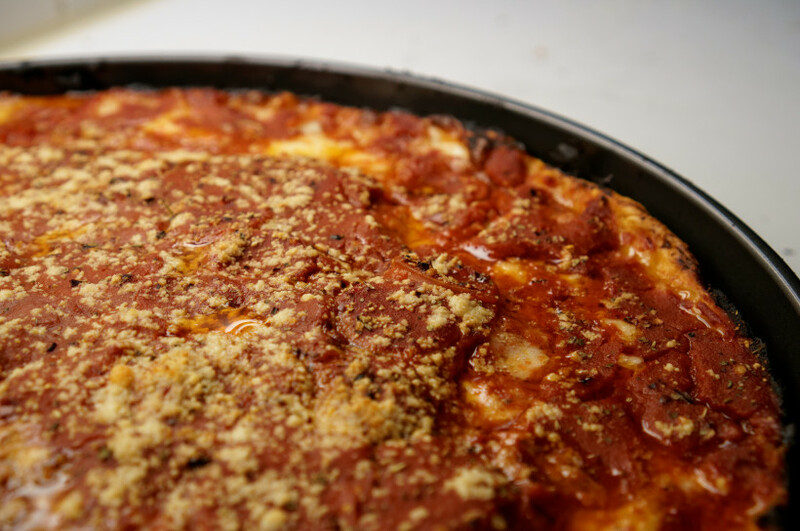 If I ordered a deep-dish in Chicago and this is what they served me, I would be at that pizzeria every time I was in town. Update: I am told by those who know that I overmixed my dough, and that I shouldn’t mix it for any longer than 60 seconds, tops. The more you know! 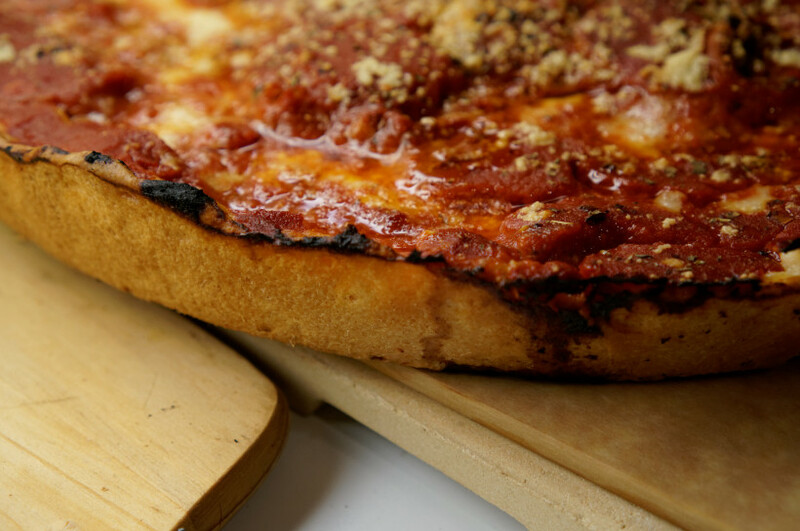 What’s best to do is use a pizza peel to drain the pizza. 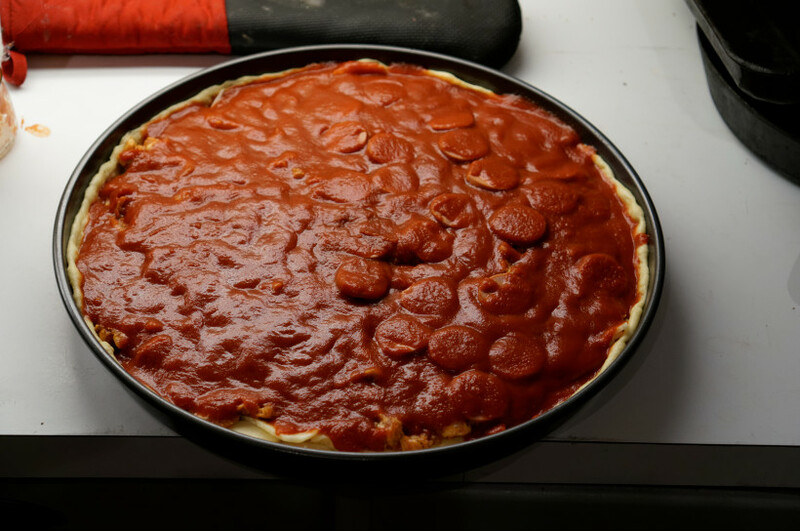 You do this by putting the peel over the top of the pizza and lifting the pan with the other hand to drain all the grease out. You should see a few ounces of grease come out. 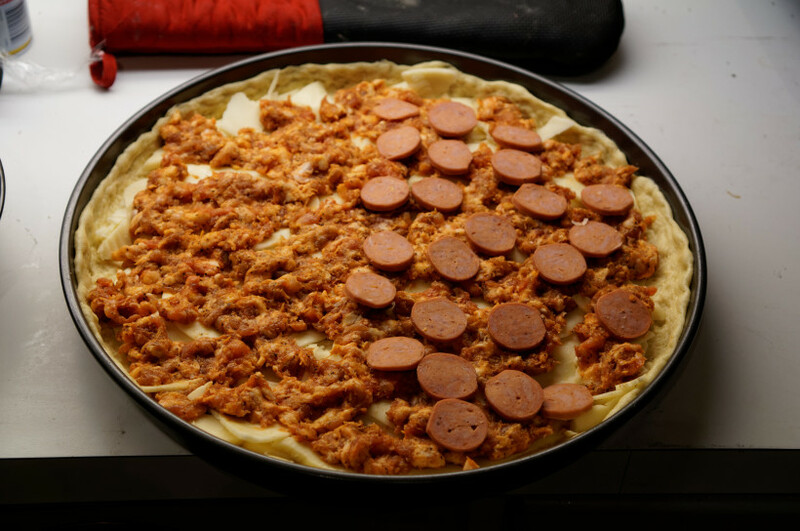 Also, to eaaily get the pizza out of the pan, take a pie shaped spatula and run it all the way around the pan, putting the spatula underneath the pizza. 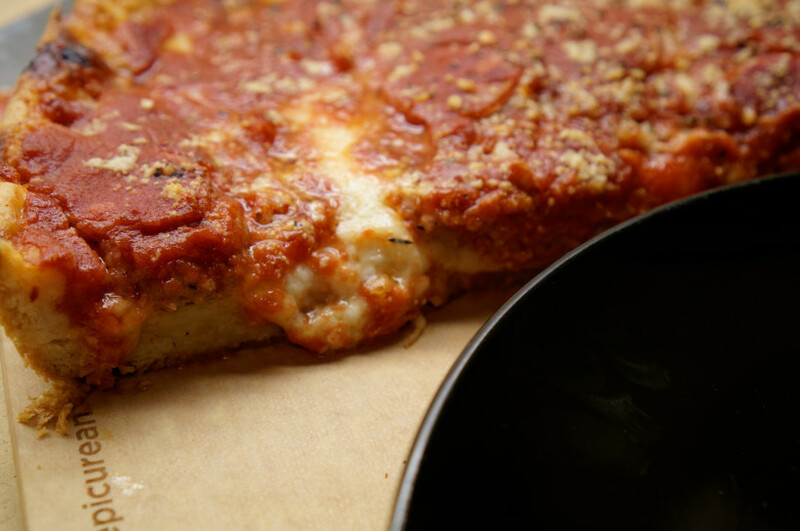 This will loosen up any baked cheese and allow you to move the pizza onto a cutting board.